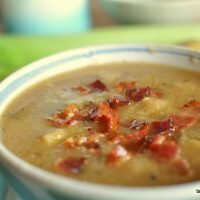 This version of potato and bacon soup is one of my favourites for winter, it just has that ‘stick to your rib’ goodness. If you wanted to get really fancy you could sprinkle with some shredded sharp cheddar before serving or grated carrot would add color too if you want to skip the cheese. This is a great recipe for those who need to skip dairy and gluten but still want a creamy, heart winter soup. In large soup pot, saute bacon until cooked do not drain. Add onion, celery and leek and cook until soft. Add in the rest of your veg. Pour in enough stock to cover the veg and add in your bay leaves and seasonings. Cook until the potatoes are soft - about 20 min. Remove 1/2 the soup and puree in a blender, add back to pot stir and serve. I like to keep my soup chunky so I don't puree it all but you could if you like a smoother soup. 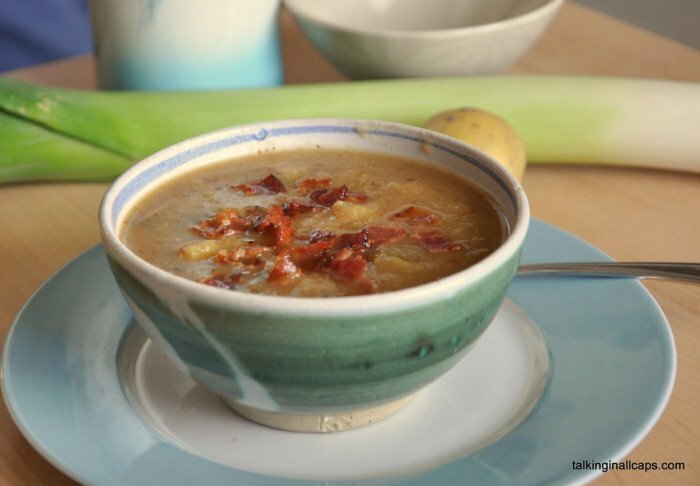 I love this as it allows for a thick, creamed soup without actually using cream or flour. If you find your soup is too watery, just simmer until it is reduced to a consistency you prefer...in reverse, if it is too thick just ad a little water or left over stock. 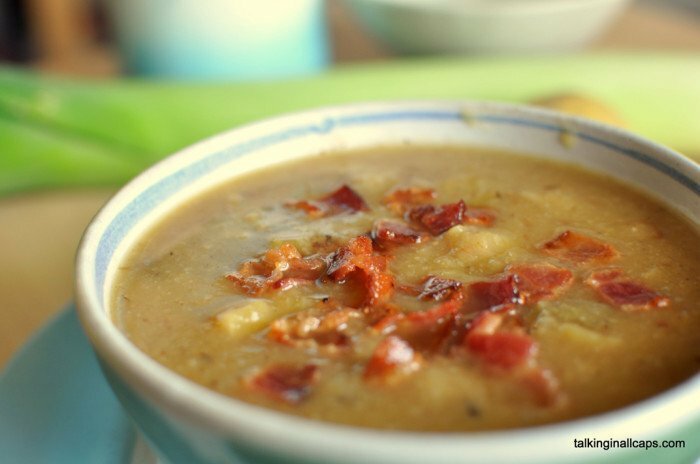 You can make this Cauliflower & Potato soup in big batches by doubling the recipe. It freezes well, just thaw, heat, stir well and serve. Thanks to Dana at Talkinginallcaps.com for making this and allowing me to use her photos! I can practically taste it, yum. I’ll probably do a variation on my cream of potato-leek recipe, with elements of your recipe mixed in. The cauliflower seems like a nice match for potatoes and leeks. Until now, I’ve been hesistant to commit to a full-on cream of cauliflower soup. But this I can work with. Oh – and crusty rolls, definitely. I would have to taste it to see if I like it. I could use turkey bacon, huh? I don’t think I’ve ever had leeks. This sounds wonderful. I live in a small town so leeks are not always available. I usually just sub green onions and regular onions for them. Four of my favorite veggies, I can hardly go wrong with this one. I made this today and it was fantastic! Not to hard to make and really delicious. Didn’t miss the dairy at all.